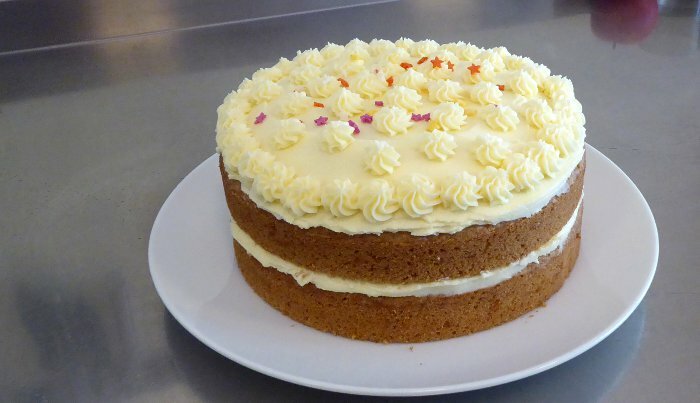 We like to slice this lemon cake in half and fill the middle with lemon curd, put the cake back together and top with the thick vanilla icing recipe given below. US equivalents for the ingredients are given in the notes. 2. Whisk soya milk and vinegar together in a large bowl. Add vegetable oil, lemon zest, sugar and flax (if using). Whisk again. 3. Weigh white flour, cornflour, soya flour, bicarbonate and baking powder together in a smaller bowl and mix well to combine. Sift into wet ingredients and mix well, whisking if necessary. 4. Pour into an oiled 7 inch round springform cake tin and place in the preheated oven. Bake for 55-65 minutes or until a cocktail stick comes out clean. Alternatively use 2 x 7 inch round cake tins and bake for 30 minutes or until a cocktail stick comes out clean. 5. Cool for 15 minutes, then take out of the tin and place the cake on a cooling rack. If you made the cake in one tin and want to split it in half horizontally, don’t do this for at least an hour after it has come out of the oven. A bread knife tends to work best for splitting the cake. 6. Put lemon curd or vanilla icing (recipe below) in the middle, and vanilla icing on top. 1. Mash margarine and vanilla essence into the sugar with a fork. This will cover the top of the cake, if you want to put some in the middle as well, make extra. If you want really thick icing replace half the margarine with vegetable fat (e.g. Trex). If possible leave the Trex out to soften for a couple of hours before using. If you can’t get hold of soya flour or don’t want to use it, replace with the same amount of cornflour. The soya flour slightly improves the texture and taste; the flax seed slightly improves the texture. But you’ll still get a good result without them. To make this recipe gluten-free: use 14 floz/400 ml soya milk; replace the plain white flour with gluten-free flour mix (i.e. Doves) or rice flour and add 1 tsp xanthan gum in with the flour. This cake and others are available to buy in our shop. Hi, I found your lemon cake recipe reposted on the bestveganguide.com site. As I’m not familiar with gluten-free baking, I followed the recipe to the letter (weighing the flours and sugar, rather than using measuring cups as I’m accustomed). Since Krista hadn’t mentioned ground flaxseeds were optional, I used 4 teaspoons after checking the conversion for 2 dessert spoons. Upon mixing the batter, it seemed very odd because it was extremely thick (not smooth), and sticky. The cake turned out 4cm (1.6″) in height even though I made it in an 8.5″ round pan vs. the 7″ pan (I assume round) you specified. The taste isn’t bad (a little too sweet for my taste) but flecks of flaxseeds are quite noticeable. I am wondering if I used too many, or may have done something else wrong? May I inquire why flaxseeds are optional? Thanks for your feedback, I’ll answer your points one by one. Firstly, don’t worry about the batter being thick and sticky, this is because of the xanthan gum. It should not be lumpy though – I always sieve the flours, xanthan and raising agents together and give the batter a really good whisk so it is even. As soon as it looks even you need to stop though – just whisk as much as it needs and no more. The cake was made in a round tin, I will update the recipe to reflect this. I would expect the cake to come out at 4cm high in a bigger tin – the tin size makes a huge difference. Sometimes I make the cake in a 9″ round tin and do need to make more mixture (the recipe above times one and a half) otherwise it would come out looking like a single layer. I have tried reducing the sugar by 1/2 oz and it works fine, though no-one has ever said it is too sweet before. If the flax seed is ground it should not be noticeable – it should not be put in whole. I grind my flax seed in a coffee grinder and over here you can often find ground flax seed in the shops. I have put flax seed as optional because it tastes pretty much the same without it. I think I have got used to making it with flax in it and also I am not 100% sure how long the cake will keep without it, so until I am sure, will continue to use it. You were correct in thinking 4 tsps. I also always use soya flour in the recipe as suggested in the alternative and it does improve the taste (though I think it is fine without it) so again I shall update the recipe to reflect this. Flaxseeds – yes to nutritional benefit and preservation. Sugar – yes I now use 1/2 oz 14g less in the recipe. I think you could probably reduce it more, but have not tried this so if you do let me know how it goes!